Your entertaining needs will be catered for with our bite size “all time favourite” Red Party Pack. 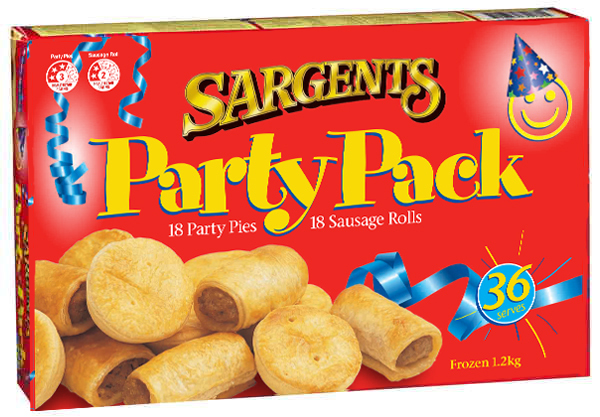 A delicious combination of 18 bite size flaky pastry sausage rolls and 18 scrumptious party pies to cater for a larger group. seasoning (herbs & spices, yeast extract, flavour enhancers (627, 631), spice extract), onion flakes, wheat fibre, salt, thickener (1422), tomato powder, emulsifiers (450, 451, 452), carrots, garlic powder, natural colour (160a), pastry glaze (milk, sugar, natural colour (160a)). Water, wheat flour, meat (16%)(beef and or mutton), margarine (animal fat (beef), vegetable fat & oil (palm), water, salt, emulsifiers (471, 322-soy), antioxidants (304, 307b-soy), acidity regulator (330), natural flavour, natural colour (160a)), thickener (1422), textured soy protein, natural colours (150a, 160a), seasoning (salt, soy, flavour enhancers (627, 631), onion powder, hydrolysed vegetable protein, black pepper), pastry glaze (milk, sugar, natural colour (160a)).